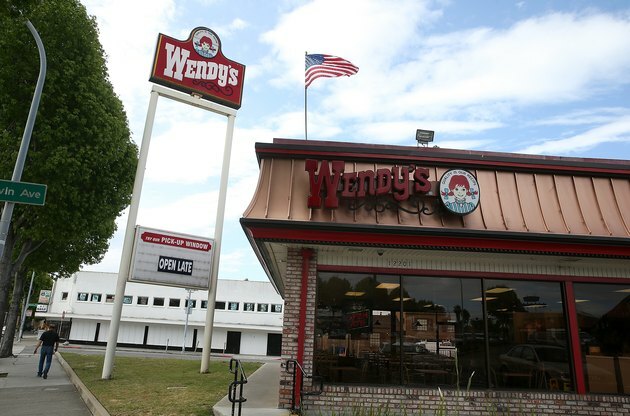 Wendy's is a popular fast food restaurant chain that offers a variety of menu items, including hamburgers, chicken, soups, salads and desserts. Breakfast is served at select Wendy's locations and offers options such as egg sandwiches, breakfast meats, fruit and potatoes. Wendy's publishes its nutritional information for each of its breakfast selections and perusing how many calories, grams of fat and sodium each item contains will help you choose the healthiest option for you. One of the stars of the Wendy's breakfast menu is its selection of breakfast sandwiches, including different sandwiches that include eggs, cheese and bacon or sausage. The Artisan Egg Sandwich with Applewood Smoked Bacon contains an egg, a strip of bacon and a slice of American cheese sandwiched between two pieces of muffin. The sandwich weighs in at 370 calories, 21 g of fat and 9 g of saturated fat. The sandwiches with sausage contain more calories and fat. The Fresh Baked Biscuit Sandwich with Sausage is made with a biscuit, an egg, a slice of cheese and a sausage patty for a total of 620 calories, 40 g of fat and 19 g of saturated fat. Each sandwich has between 650 and 1,500 mg of sodium as well, making them high in calories, fat and sodium. Wendy's offers alternates to the traditional breakfast sandwiches, including a breakfast burrito a panini sandwiches. The Bacon Fire-Roasted Burrito contains eggs, cheese, peppers and bacon wrapped inside a large multi-grain tortilla. It contains 520 calories, 28 g of fat and 11 g of saturated fat. The Morning Melt Panini sandwiches are one of the least healthiest options on the breakfast menu. They are made with egg, cheese, panini bread and your choice of bacon or sausage. The bacon panini contains 570 calories, 38 g of fat and 19 g of saturated fat while the sausage panini contains 690 calories, 49 g of fat and 23 g of saturated fat. Each sandwich has around 1,000 g of sodium as well. The breakfast potatoes at Wendy's are skin-on, which boosts their nutritional value by adding additional vitamins and minerals. They are seasoned with sea salt, cracked black pepper and garlic powder. The Seasoned Home-Style Potatoes are a fairly healthy choice at only 190 calories, 8 g of fat, 1.5 g of saturated fat and 560 mg of sodium per serving. The fruit and oatmeal bar selections off the Wendy's breakfast menu are the healthiest choices. Wendy's offers fruit combinations that include grapes, strawberries, pineapple and apples. Each fruit cup contains only 50 calories, 0 g of fat and 0 mg of sodium. The oatmeal bars are filled with oats and dried blueberries or cranberries and are baked fresh at Wendy's. Each bar contains 280 calories, 10 g of fat, 4.5 g of saturated fat and 220 mg of sodium. According to Joanne V. Lichten, author of "Dining Lean - How to Eat Healthy When You're Not at Home," you can find healthy breakfast options at fast food restaurants. Look for menu items that do not contain breakfast meats, such as bacon or sausage, because these add unhealthy calories and saturated fat. Consider having your Wendy's breakfast sandwich, burrito or panini with just eggs and cheese. Add a fruit cup for a nutrient boost with just a few additional calories.